We stand behind each and every product on our shelves. We love them. We use them. You’ll love them too! Not sure what to get? Just ask us and we’ll help you find the perfect product that’s just right for you…and your hair! A classic line of hair care products and the perfect compliment to the Goldwell Hair Color we use at our salon. Featuring a complete collection of shampoos, conditioners, styling and finishing products. 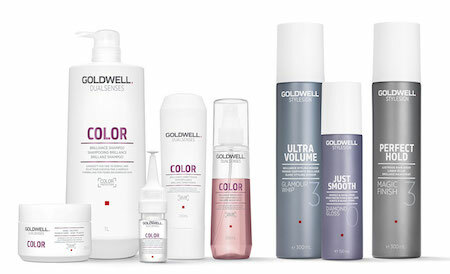 You can't go wrong with anything Goldwell! One of our best sellers, the Color Brilliance Shampoo and Color Brilliance Conditioner has a delicious smelling pomegranate essence that will leave your hair feeling amazing while preserving your color in between salon visits. Color safe. A product for each specific hair type. These edgy, affordable and just plain cool looking products are the latest and greatest addition to Tease. Not only do they look good on the outside, they do good stuff to your hair on the inside! The way these products perform and make your hair feel is nothing short of magic. You will feel just how amazing they really are the very first time you put them into your hair. 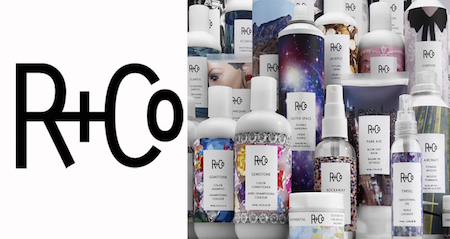 Whether your hair is fine, thick or curly, - dry, damaged or oily, R+Co's got you covered. With a complete line of shampoos, conditioners, styling and finishing products, there's something for everyone. Great for all hair types. Vegetarian, paraben-free, sulfate-free, cruelty-free, gluten-free and color-safe. Can't get to the salon? Click below to shop R+Co online! 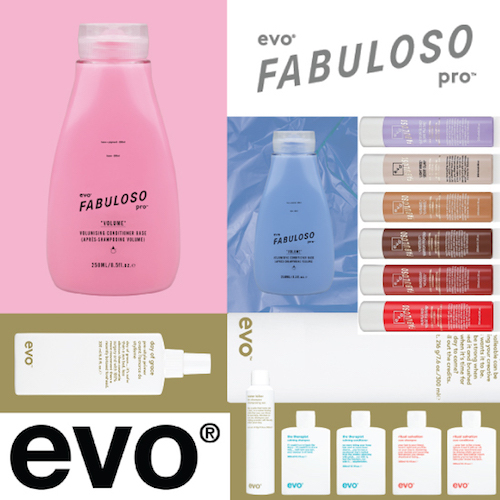 We absolutely fell in love with EVO products the moment we tried them. We know you'll love them too! On the outside, you'll find products with hilarious names and bottles bursting with humor, wit and personality. On the inside, you'll find all the good stuff to give you amazing hair! These simple, yet luxurious hair care products contain no sulphate, paraben, dea, tea or propylene glycol. They do exactly what they say...and they do it well! EVO delivers professional salon results all while respecting the environment. Avoid bad hair days...Use EVO! Color safe. Products for every hair type. Fresh and clean scent. One of our top sellers, Milk_Shake is a line of hair care products for those who prefer to use products with natural ingredients such as milk proteins and fruit extracts in them. This line has lots of unique products that will completely transform dull dry locks into fabulous, healthy looking hair. The Whipped Cream Leave-In Conditioner is one of our favorite products. It conditions, prevents static, tames frizz, and it won't weigh hair down. It smells like vanilla cupcakes! The popular Silver Shine toning shampoo really kicks some serious brass! This stuff will clean up a dirty blonde in seconds. It's enriched with organic mixed berry extracts, vitamin rich blueberries, violet pigment and milk protein for shiny, healthy hair. Neutralizes unwanted yellow tones instantly. Color safe. A product for each specific hair type. Natural and organic ingredients. Not tested on animals. 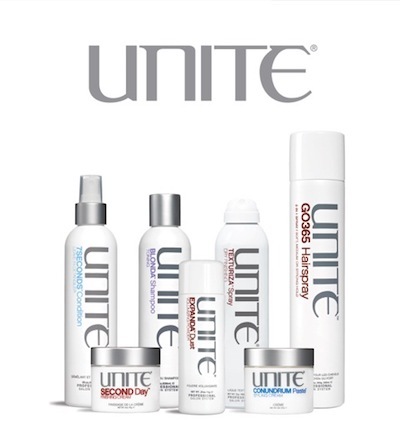 UNITE is a luxurious, boutique hair care line, created by hair stylists, for hair stylists using only the best ingredients around. We now carry our Client Top 10 best sellers of this line including: The 7 Seconds Shampoo, Conditioner, Leave-In and Glossing spray, Weekender shampoo, Smooth & Shine, U-Oil, Tricky Lite spray wax, Second Day styling paste and Texturiza styling spray. Great for all hair types. Sulfate-free, paraben-free, sodium chloride-free, not tested on animals. Smells de-licious!!! 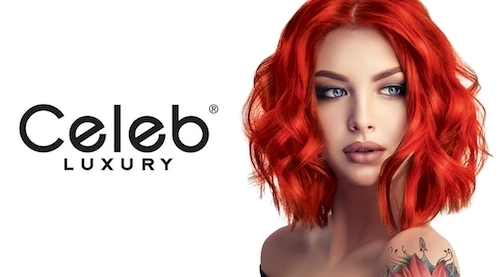 Keep your salon fresh color at home! These highly pigmented shampoos and conditioners will keep your bold fashion shades or natural hair colors fresh between salon visits. The more you shampoo, the more color you deposit. You have complete control over how vibrant your color gets. Color depositing/toning shampoos and conditioners. Shade specific for every color. 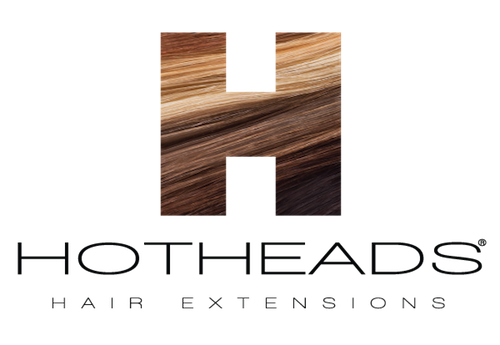 Hotheads are 100% human hair, adhesive weft extensions that are applied without the need for tools or damaging heat. They are gentle on your natural hair and can be worn for up to 8-10 weeks. No worries...they stay in place, won't shed and you can shampoo and style Hotheads just like you would your own natural hair. Best of all, Hotheads can be re-used up to three times! We love these extensions so much, we wear them ourselves! The Hotheads Hair Care line contains no alcohol, oil or sulfates that can cause the adhesive bond to become weakened. They are made from the only purest ingredients, giving your extensions the nourishment they need to last longer and look amazing week after week. Color safe. Gentle on hair. Instant gratification! 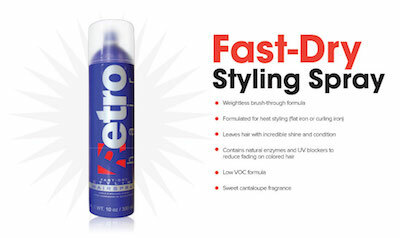 We absolutely LOVE Fast Dry Styling Spray. It's our go-to spray for all of our styling. You've never used anything like this before...we promise! This amazing spray can be used with any type of iron work...and guess what? It doesn't stick! You can even flat iron with this stuff! Great for all hair types. Layer it for even more control. Adds shine as it styles. Sweet cantaloupe fragrance. Jane Iredale cosmetics are known as "the skin care makeup". This stuff is pure magic! Not only does it make you look absolutely flawless, it's also good for your skin. Got dark circles, bruising, spots and other skin imperfections? No worries...this stuff really covers it! Whether you like a natural look, full on glam, or you dig a more edgy look, this highly pigmented mineral based makeup can do it all. It also doubles as an airbrush foundation. A complete line of cosmetics including: primers, concealers, foundations, powders, blushes, bronzers, highlighters, eyeshadows, eyeliners, mascaras, brow kits, lipliners, lipsticks, lipgloss, setting & hydration sprays and professional brushes. We offer the full line of Jane Iredale cosmetics available for purchase. 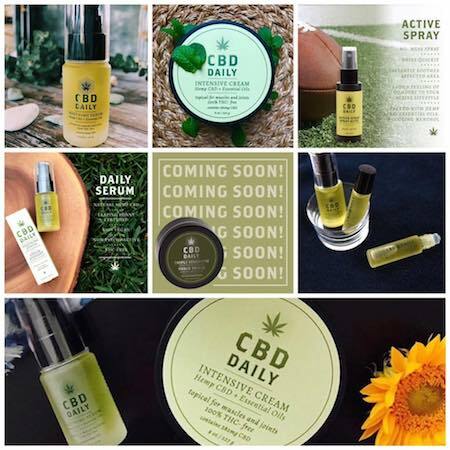 Don’t leave home without your dose of CBD Daily! CBD Daily soothes sore muscles, relieves discomfort, and reduces painful aches almost instantly. Packed with essential oils including powerful Hemp CBD, Shea Butter, Aloe, Lavender, and other beneficial naturally derived ingredients, it targets pain and creates an immediate soothing sensation, while moisturizing your skin. Does not contain THC, and is not psychoactive. 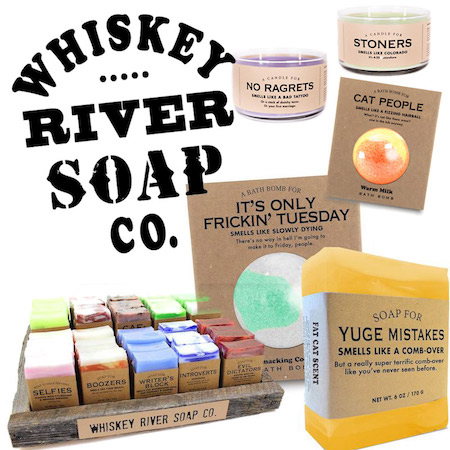 Whiskey River Soap Co. combines over-the-top humor with handmade quality to create a line of witty and laugh-out-loud candles, soaps and bath bombs. Handmade and poured in L.A. - Evil Queen Candles are candles with an attitude! Made with 100% soy wax and hand-blended fragrances, these vegan, eco-friendly candles make the perfect gift for any occasion. You can party all night with their 50 hour burn time. If you love candles as much as we do, you need some of these in your life!